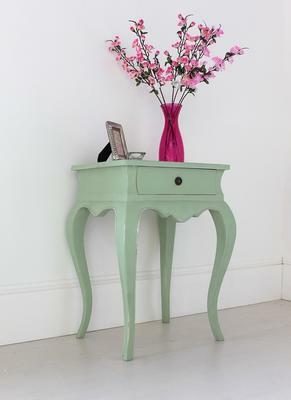 Go Green in your bedroom, with this lovely Vintage Green French Bedside Table. Designed for both beauty and accessibility, this lovely piece is handmade by skilled experts for your use. 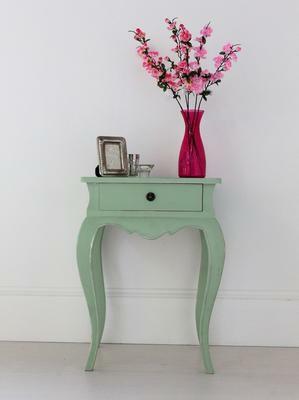 It's made using mahogany wood and crafted with a smooth top surface for holding a vase or a picture frame. A single drawer with a ring pull handle can be found at the centre, perfect for keeping important items like medication, emergency supplies and more. 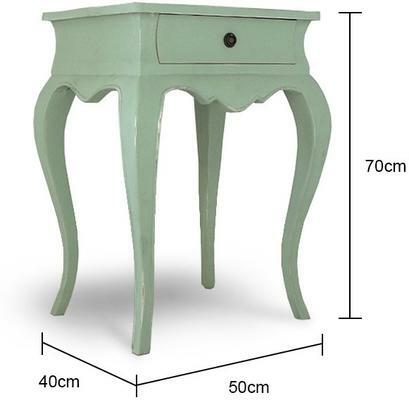 At the bottom, the table is fitted with lovely curved shaped legs, echoing a very distinct French look. Perfect for your bedside or for your living room, this handy table will become an indispensable and stylish part of your space.